Traffic heads south on Interstate 89 at the Waterbury exit where bridge construction has created some tricky travel. 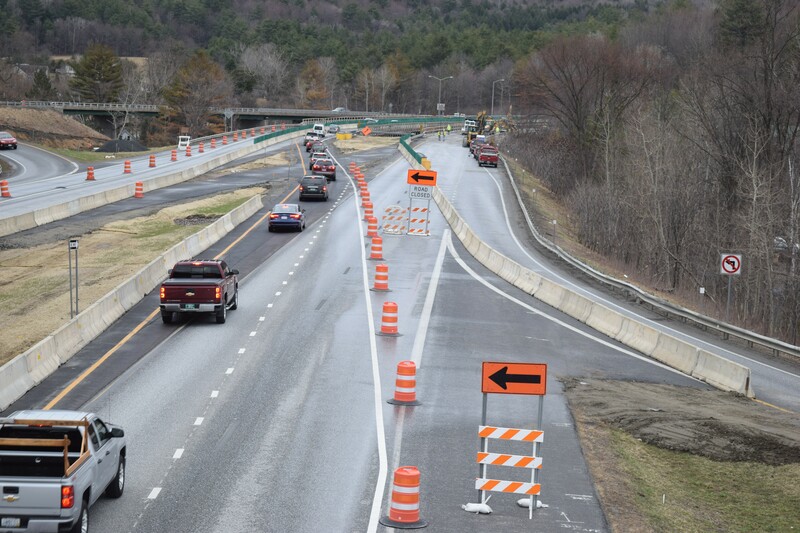 Drivers who’ve passed the Waterbury exit on Interstate 89 going either north or south in the past couple of weeks have likely noticed it’s quite an obstacle course. So has the Vermont Agency of Transportation. A two-year, $11 million construction project has thrown such a wrench in the traffic pattern that the agency — for the first time ever — has a tow truck standing by during rush hour. Just in case. “It’s a challenge,” said Kevin Marshia, deputy chief engineer for the agency. "It's a pretty unique project." The configuration can look like an accident waiting to happen. One did occur early Friday afternoon. A northbound driver who was fiddling with his oxygen tank and driving faster than the speed limit flipped his car into the median, according to state police. Nobody was hurt. State police said the driver is likely to be ticketed. That’s the only accident reported in the construction zone since the project started two weeks ago, but state officials know there have been enough close calls that they are working to tweak the setup. The project is designed to replace three aging bridges. The first to get attention is designated for the southbound lanes. Those lanes are closed, and southbound traffic must cross over to what is normally a northbound lane. Traffic is narrowed to one lane in each direction just as drivers reach the Waterbury exit. That has forced some fancy maneuvering. As drivers approach the project from either direction, and before it narrows to one lane, signs direct them to choose a lane. Stay right to get off at Waterbury. Stay left to continue on the interstate. Plenty of drivers have shown they either weren’t paying attention to the signs or didn’t understand. Finding themselves in the wrong lane, a considerable number have been darting over to the other lane at the last second. A series of white stanchions serving as lane dividers were being knocked down like ski gates on a downhill racecourse. “People are not making great choices out there,” Marshia said. Relaying the details of what’s ahead via electronic signs to motorists traveling at 65 mph or faster is tough, Marshia said, but drivers aren’t doing their part either. “Part of it is the message. Part of it is people not paying attention,” he said. Friday afternoon, the flattened white poles by the northbound lane were replaced with taller, more visible orange ones and orange barrels. Similar changes were being made this week to the southbound side. Marshia said he hopes to have a more comprehensive solution within a few days, but it’s going to take a balance of better signage and barriers. Simply adding signs might just generate more confusion, he said. Just when motorist get used to the configuration, it is due to change midway through summer, when work shifts to the northbound bridge. AOT offers details on the project at its website.